ATOMIC WEIGHT – 196.96655 – MELTING POINT – 1064.18 DEGREES C. / 1947.52 DEGREES F.
It is not necessary to remove any enamel or cement from dental gold scrap. Serious injury can result. These materials are vaporized during the melting process or we have the equipment to remove them. We do not retrieve gemstones from scrap gold. If any stones have value to you, remove them before shipping in scrap. It is not necessary to remove any unwanted stones from Karat gold jewelry scrap as they are vaporized in the melting process. Midwest Refineries pays 95% of the amount of pure gold contained in your order. Gold orders under 3 troy ounces are purchased outright, based on average after melt weight loss and karat purity. Gold orders of 3 troy ounces or more are melted and assayed to determine exact gold content. All gold-filled material purchased outright at 15% of the spot price PER POUND. No gold-filled with stainless steel accepted. Gold is the most non-reactive of all metals. It never reacts with oxygen, so it does not rust or tarnish. The gold burial mask of King Tutankhamen looked as brilliant when discovered in 1922 as when it was entombed in 1352 BC. Gold is the most ductile of all metals, allowing it to be drawn out into tiny wires or threads without breaking. A single ounce of gold can be drawn into a wire 5 miles long! Each ounce of gold requires the processing of over 6000 pounds of ore! The gold rush of the mid-19th century expended 125 million troy ounces of gold, worth more than $50 billion by today’s standards! The expression “go West young man, go West” was born from the gold rush in the Western United States. In 1854 the largest gold nugget ever found was in California at Carson Hill above the Stanislaus River. It weighed 195 pounds and was valued at $43,534.00 in the currency of the day! The main producers of gold are South Africa, the United States, Australia, China, Canada and Russia. Family owned and operated since 1939, Midwest Refineries enjoys a repeat customer loyalty that is unequaled in the precious metal refining industry. 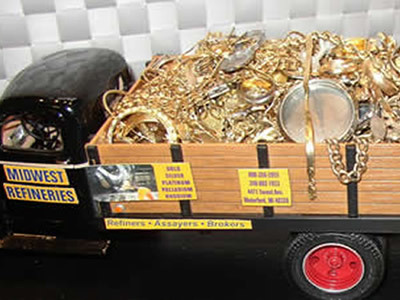 From small shipments sent in to us from the general public, like a few items of unwanted gold jewelry or dental gold scrap, to large refining lots from manufacturing jewelers and dental laboratories, Midwest Refineries is the right choice to sell or recycle all gold contained precious metals. Our modern assay laboratory and our commitment to service,insures you will receive the highest settlements and returns for your gold materials. 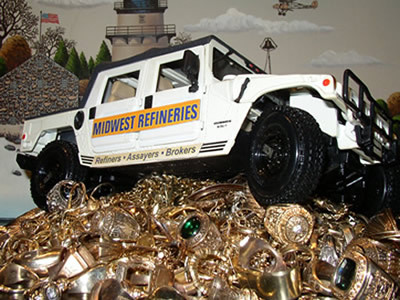 If you have not used Midwest Refineries before, we would welcome the opportunity to be of service to you as gold buyers, smelters and refiners. We are confident you will be satisfied with your gold transaction with us. We are proud of our reputation as gold refiners and will continue to service all our customers, large and small, with integrity and trust. We are never too busy to talk to you about your particular gold materials and how we may be of benefit to you. Just had to say ‘THANKS!’ for the quick turnaround, and the nice check, you sent me for my scrap gold & silver! This will go a long way to making our summer vacation/trip a nice one! Thanks again! Michele B., KS. I cannot begin to tell you how pleased and amazed I am at the service I just received!! When I called on Friday to ask about processing times, I was told it would be 1-3 days (after you received my gold scrap) and I was totally fine with that. I then called again to get details on the possibility of doing a bank wire instead of a check, and I was given all the information and opted to go with the bank wire transfer. Once the details were set, I mailed the scrap to you later that day. Now, it is only Monday (3 days later) and I am emailing to thank you because the money is in my account already!!! At a time when time was of the essence for a project I am working on, you all came through for me more than I could ever have expected!! I have used you many times over the years and I always refer others to you, but I will definitely be insisting they use you because of your awesome customer service. Thank you again… I will be a loyal customer for years! Best, Rhonda R., FL. Wow Gary! My local jeweler offered me $2200 for my 22-karat gold so I took a chance and mailed it off to you on Tuesday 10/30. Today—Monday—less than a week later there’s a check in my mailbox for $4366. I am very happy with your service and I will use you again. Thank you! Sally, CA. Thanks Gary, I got my check today for my dental gold…appreciate very much not only the fairness of your settlement, but the fast turnaround. You folks are the trusted pros! Thomas C., La Quinta, CA. Gary, I want to take the time to tell you that it’s refreshing to deal with an honest business. It happens too infrequently lately. You explained everything very well and you did exactly what you said you’d do, even more quickly than I expected! I’ve told people about your company for years (heard about you through the silver collector’s grapevine in Chicago) but never had a reason to contact you until recently. Why anyone would use one of the mail-in T.V. buyers is beyond me. Thanks for offering the fairest terms in the industry and I will not only continue to use your services, I’ll tell anyone that needs to sell their scrap or unwanted jewelry to send it to you! Thanks again, we are very pleased with your service! Kyle T., GA.
Gary, Thank you for returning my check so quickly! The information you sent with the check clearly outlined the amount and weights of the gold rings I sent to you after they were refined to pure gold. I also want to say that your honesty is impeccable. Although you found one ring to be “heavy electroplate gold” you were honest enough to identify another ring that was in my 14K package to be really 18K! Let me tell you that I knew I wasn’t going to get paid 100% of my calculated weight as I knew there are factors that reduce the total such as stone weight and miss-marked jewelry, like that electro-plate ring I thought might be 14K. However, you paid me a lot more than my local coin dealer was offering including shipping. This gold and silver business has its share of dishonest people and companies. I must admit that since this was my first transaction with your company, I was a little apprehensive sending that much gold to a stranger. However, you really lived up to that BBB rating of A (A+ in my book) found on your website. I really appreciate your honesty and attention to detail to get me the best value so quickly (2-day turnaround! -AMAZING!) Paul From California. Hello Gary, I just got the mail today and found your quick payment for the silverware that was sent you last week. You are exactly what your company says you are, and I am very pleased. I hope to do further business with you, and I will be certain to let my friends know about your business. Thanks for the great service. Go Michigan! Dan C., MI. Gary, I wanted to send you a quick email concerning my transaction with Midwest. This was the first time I had sent anything to you, in the past had dealt face to face with buyers of gold and silver. I was a little apprehensive to say the least but Thank You for calming my nerves not only did the transaction go as your company promised but the payout is far better than anyone I have dealt with in the past. Thanks again for being a stand-up company. Chris S., ID. Gary, I recently sent your company some placer gold that I had attained during my years of prospecting. I had checked around trying to find out what my gold was worth locally and either found that nobody would deal in placer gold or would only offer me 20 to 40 percent of value. In less than two weeks I had your check in hand at a rate exactly as advertised in your on-line information. You can be sure that if I have more gold, of any kind to sell, that I will be dealing with your company. I would be happy to refer anyone thinking of selling their gold to contact your company before dealing with the local buyers here. Sincerely, Kenneth B., Las Vegas, NV. Dear Gary, I just had to tell you that in all my years as a jeweler. I have never had such trouble free, such kind, such quick refining services for such a value in my whole life. You can absolutely be certain that whenever I can, I will be telling folks to send their precious metals to you. Funny how just a note from a real person, plus fabulous service just makes a person’s day. You have made my whole week. Hope to send some business your way. You all are outstanding. I’d trust you with my wallet. God bless and keep you and yours, Linda P., NE. Hello again Midwest Refineries. I was pleased with my check for the dental gold scraps I sent to you a couple of months ago. My late Father was a dentist and had accumulated these materials over several years. 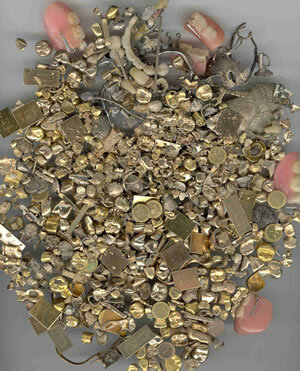 We have found more scrap dental gold, which is included in this shipment. Thanks again for your fast service. Sam P. , MA. Here’s another package of 10K, 14K and a gold pocket watch case that I don’t know what karat? I always like doing business with your company and even though I’m a small customer, I’m always delighted in receiving more for my gold then I figured. Sincerely, Mary M., TX. Gary, enclosed is 95 troy ounces of mixed karat gold. 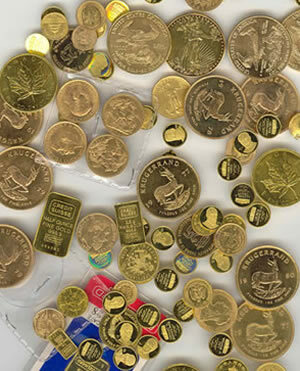 I would like 2 gold coins, preferably American eagles and the rest sent via bank wire to …… We have some gold sputter targets (used) we will ship next week. Always a pleasure doing business with you. Regards, J.C.W., CA. Dear Midwest Refineries, enclosed is another shipment of gold flake from a plating machine. It is dried out better than last time. Thanks for the quick settlement on my last order. Looking forward to doing more business with you as I accumulate more. 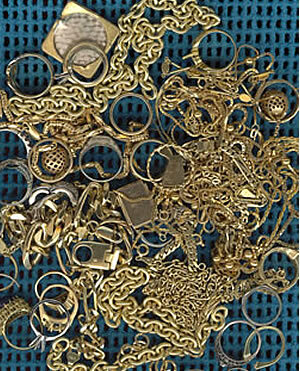 Raymond F., PA.
Found more precious metal jewelry with my metal detector which is enclosed. I have posted a positive feedback on our metal detector hobby forum and will continue to recommend you to my fellow hobbyists. Thank-you for your honest ethics. Sincerely, Alvin C. , FL. Hi Gary. Enclosed is approximately 250 grams of scrap 18 karat gold, about 47 grams of dental gold with some enamel still intact, and a 10 K class ring with stone (19.2 grams) for refining. Also, there is a small bag of bench filings and sweeps enclosed that weighs about 6 troy ounces. As usual, a check will be fine. I’ve recommended your company to a jeweler friend of mine, who has been unsatisfied with his last 2 returns from another refiner. He will be contacting you soon. Best regards, Bradley G.,MI. Gary….you have the best refinery on the internet. Nobody caters to the little guy like you do. Very best regards, Phyllis Z., MI. 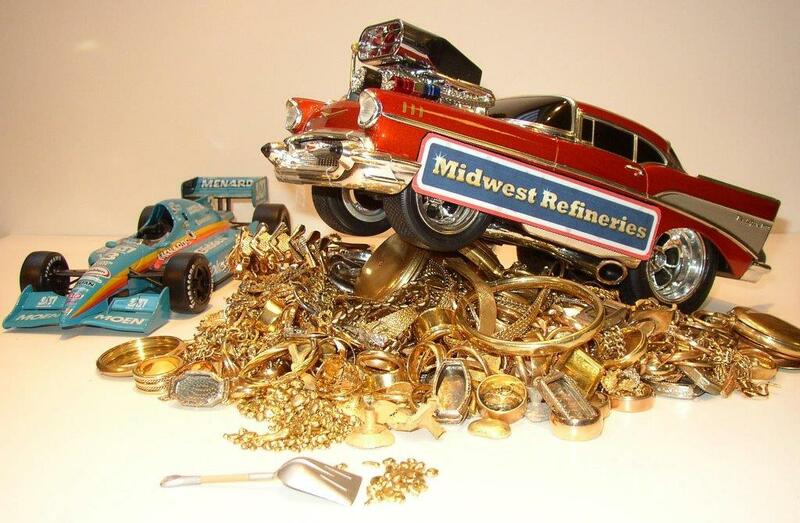 Midwest Refineries, here is another shipment of scrap gold jewelry for refining. We have tried many refiners over our 36 years in business and have to say how pleased we have been with your professional, smelting services. We will continue to use Midwest when selling our precious metal scraps. You get our vote. Sincerely, Jack B., IL. Once again you have proven this is the top site for gold scrap selling. Thank you very much. I always refer you to my friends that want to sell gold. Thanks. Pedro R., TX. Here’s another batch. I found you through the internet and I could have really gotten a bad group but you’ve consistently beat your competition in payment, honesty and total commitment to your customers. Thanks so much, Sharon L, Ca.